Packaging - Simple red, thin box that opens on the end. Even the graphics aren't spectacular so I was surprised I sampled it so early. 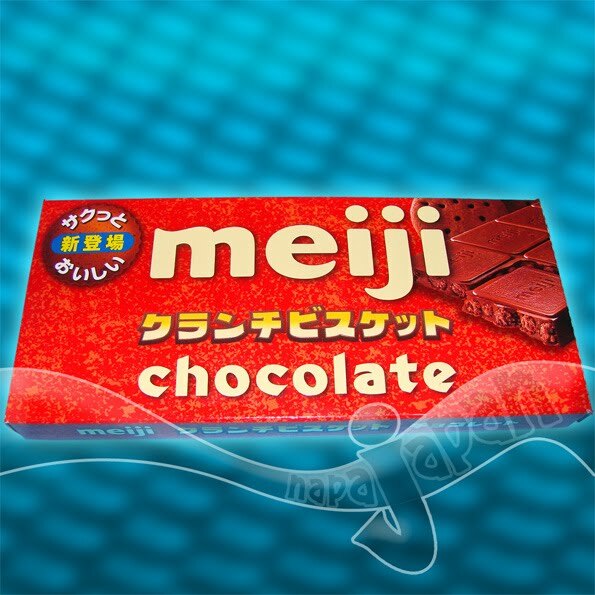 The huge Meiji letters are probably what drew me too it (if you have read my previous write-ups on products you will know how much of a fan of Meiji chocolate I am.) There is a foil 'pouch' inside containing the bar rather than typical foil wrapping. This must keep it much fresher. Best before date on box is nearly a year out. 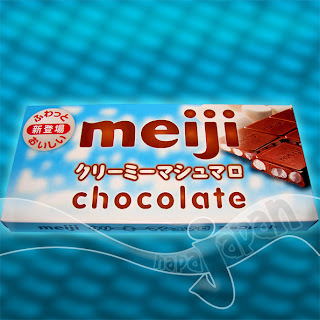 Here is the other Meiji Creamy Marshmallow Bar released on the same day. At First Glance - The chocolate looked very plain except for the sectional score lines and the prospect of some yummy looking chocolate bits poking through at the bottom of the bar. 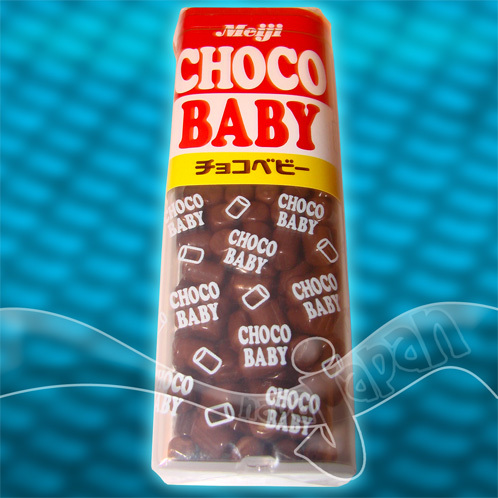 Also I noticed the chocolate to be much softer than typical chocolate bars in its category, despite the fact I ate it on a hot summer evening. What's Inside - I'll tell you what is inside: A TON of mini chocolate cookie bits about the same size as small chocolate chips. The official name on the box contains "biscuit" but being from Canada that word definitely doesn't describe these chocolate COOKIES! To some it is semantics but for me biscuit is such a old-fashioned, boring name. The Taste - Double chocolate delight! 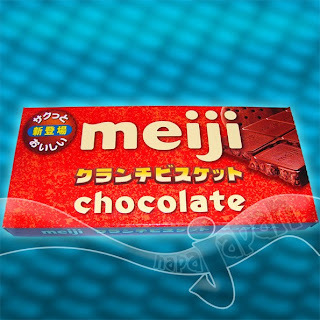 First off, Meiji makes the best mass-produced chocolate in Japan (IMO.) The embedded chocolate bits turn out to taste like crunchy brownies and they match the soft chocolate perfectly in both texture and flavor. I usually don't finish a bar in one sitting but this one just didn't have a chance. 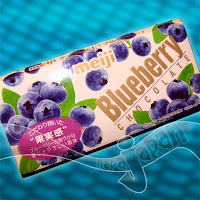 Extra Details - I scoffed the last half of this bar down as I sipped my Japanese Whiskey on the rocks. They worked well together and made a satisfying nightcap. 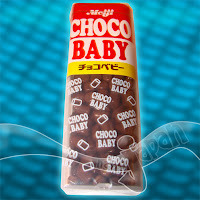 Try the marshmallow version if you like really sweet treats. Ten Star rating - 8.5/10 I was going to give it a 10 but I suppose I am slightly biased after drinking Whiskey (I feel great!) 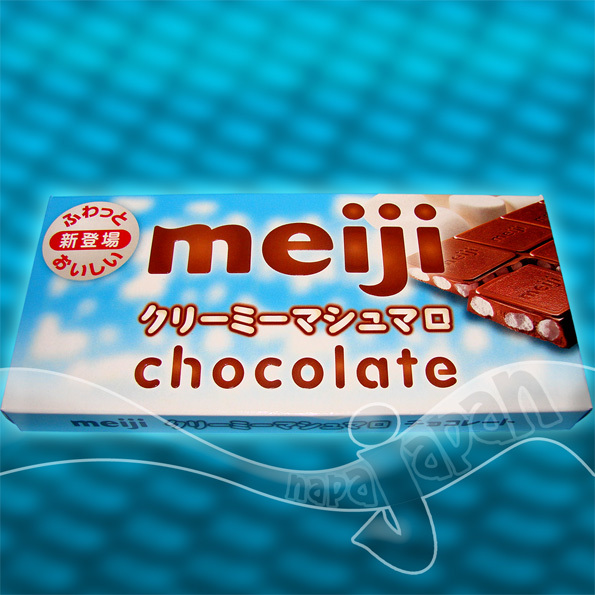 and also the fact Meiji can do no wrong with me.